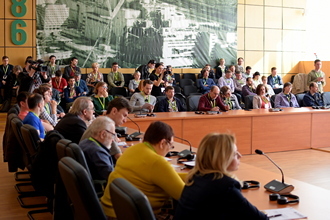 ІV International Conference on Nuclear Decommissioning and Environment Recovery INUDECO 2019 got started on April 25 within the framework of the activities dedicated to the 33rd anniversary of the Chornobyl NPP accident. The Conference is held to address problems and perspectives, increase the efficiency level of scientific and practical research, establish cooperation and exchange of experience in decommissioning of nuclear facilities and environmental recovery. 150 representatives from Ukraine, Norway, Denmark, France, Japan and Spain have participated in the Conference. The First Deputy Director General of SSE ChNPP Valeriy Seyda in his welcome speech addressed the participants. The key speakers opened the conference: Oleg Nasvit — First Deputy Head of the State Agency of Ukraine on Exclusion Zone Management; Yurii Fomichev – Mayor of Slavutych; Anatolii Nosovskyi — Director of Institute for Safety Problems of NPPs, NAS of Ukraine; Niels-Kristian Mark — Senior Scientific Officer of Institute for Energy Technology (IFE, Norway), Technical Project Manager of “Creation and Development of Chornobyl Decommissioning Visualization Center (CDVC)”; Mark Zhelezniak and Shigekazu Hirao — Fukushima University (Japan). On April 22 the New Safe Confinement was transferred to trial operation mode. During the trial operation practically all NSC equipment and systems will be operated in the design mode within 72 hours. The goal of the trial operation is to make sure that all equipment and devices are operated in the design mode and perform their functions. In addition, such operation will allow checking the level of ChNPP's personnel qualification gained during the training. The test subject during the trial operation is the conditional dismantling of SO unstable structures. The first stage of the trial operation was devoted to the testing of the main cranes system (hereinafter: MCS): movement of carriages from bridge cranes to maintenance garages (northern and southern garages). During the second testing day the MCS crane run-way beams were inspected and movement of two cranes (western and eastern) over the Shelter Object roof was tested. 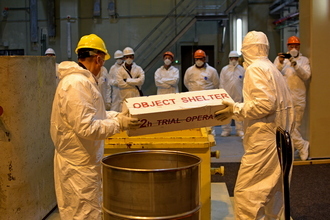 After that dismantling, lifting and movement to the temporary storage site of a metal truss, established during the Shelter Object stabilization measures, was simulated. Today, on the 19th of April 2019, representatives of ministries, central executive authorities and the Secretariat of the Cabinet of Ministers of Ukraine have made a working visit to the industrial site of ChNPP. The aim of the working visit is to familiarize with the progress of regional development projects implemented in Kyiv Region through the funds of the State Regional Development Fund, as well as with the status of the Chornobyl Exclusion Zone and its current activities. During the visit, the delegation members visited the construction site of the Interim Spent Fuel Storage Facility of dry type (ISF-2) designed for acceptance, processing and storage of spent fuel assemblies accumulated during ChNPP operation for a period of 100 years. The visitors got familiar with the progress of activities connected to ISF-2 preparation for “hot tests”, and had a look at the railcar acceptance room and the Spent Fuel Processing Facility. Day 1 of the mission was dedicated to presenting ChNPP’s approach to SNF storage process. 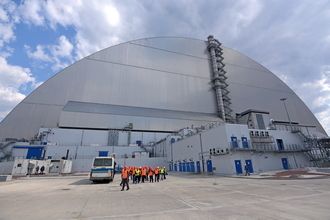 In particular, during the presentation it was mentioned that currently SNF is being stored at a wet-type interim storage facility at ChNPP industrial site, while the Interim Spent Fuel Storage Facility of dry type (ISF-2) is currently under construction, financed through the Nuclear Safety Account of European Bank for Reconstruction and Development. Experts of the support mission are representatives of Ignalina NPP (Lithuania), Paks NPP (Hungaria), Doel NPP (Belgium), and Ontario Power Generation (Canada); all of them have got long-term practical experience in dry storage of spent nuclear fuel. As a result of this mission it is expected to receive information which will help to minimize faults connected to long-term dry storage of SNF and gain practical experience in this activity by ChNPP personnel. 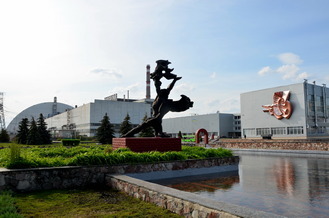 A Contest for the best sketch design for creation of a mural at the Chornobyl NPP commences on April 3. A painting will be located at the Eastern wall of the Turbine Hall facing the office rooms of the ChNPP. Thus, each day about thousand persons from the Plant’s staff and visitors will see this mural. The Contest’s task is to develop the mural’s design including a colour sketch, name of the design, concept and brief description. The design must be tailored to 18.5 m х 57.9 m dimensions. Number of works from one participant is not limited. A winner of the Contest is awarded with an exclusive 2-day individual excursion to the Chornobyl NPP and Prypiat, and money reward as well.